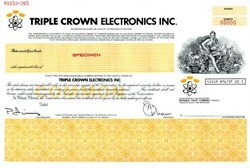 Beautifully engraved SPECIMEN certificate from Triple Crown Electronics Inc. 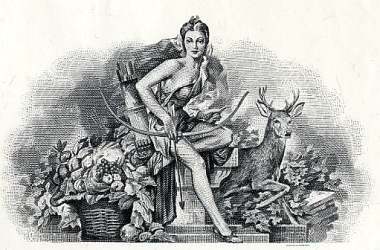 This historic document was printed by the British American Bank Note Company and has a block border with a vignette of an allegorical woman with a bow and arrows and a deer coming out from behind her. This item has the printed signatures of the Company's President and Vice-President. On September 1, 2000 CableServ Electronics Ltd. and Triple Crown Electronics Inc. megged their businesses. The combined is called CableServ Inc. Because Triple Crown had a long history of providing cablesystems with quality CATV equipment, and like CableServ, Triple Crown manufactured a line of RF amplifiers for various CATV applications. CableServ designed & manufactured a line of RF amplifiers for the CATV Market including the CHAS Headend Amplifier System as well as aftermarket return amplifiers and accessories for many of the major manufacturer's amplifiers.